Jeremiah Stokes' Thunder Cave began as a compilation of bedtime stories he made up for his children "on the spot". 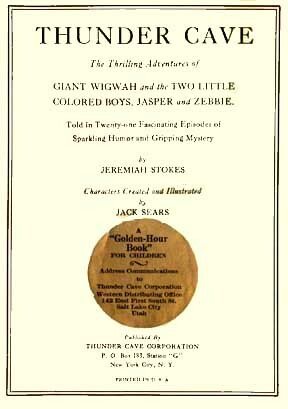 Some copies of the 1932 edition are somewhat unique in that, affixed to the actual title page (in the space between the name of Jack Sears and the publication address in New York), is the seal stating "A 'Golden-Hour Book' for Children ~ Address Communications to Thunder Cave Corporation, Western Distributing Office, 142 East First South St., Salt Lake City, Utah". Please see the links below. More images and information on the 1932 edition are planned as time and health permit.